These collars are suitable for Whippets,Greyhounds, Wolfhounds, Deerhounds, Salukis, all Lurchers and other large dogs with long necks. 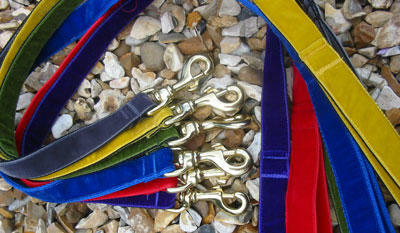 I have also made these for Collies, Labradors,Rottweilers, Great Danes, Staffies and other Bull Breeds. Recommended for outdoor walking use/lead attachment. They are really too wide to be used as an indoor/house collar. All collars have satin linings. All are washable at 40 in a machine. The fittings are solid brass. Super strong and tough for outdoor walkies. Go on, chuck that uncomfortable leather collar away!